My LYS had a book about felting on display. The book had a section on children's mittens. 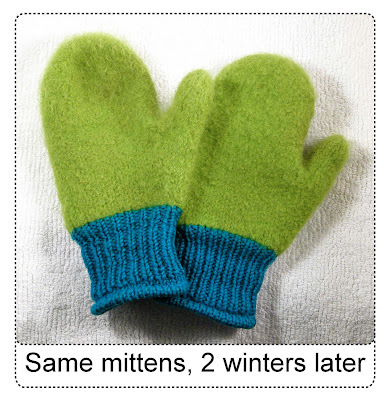 It recommended casting on in cotton, knitting a few rounds, switching to wool, making the mittens, felting the mittens, removing the waste cotton and then knitting the cuff into the holes where the cotton had been. Hmmm. Well...it would work, yes. You COULD do it that way. But...why? What a lot of work. Does it work? You bet. Did it hold up? See for yourself. Here are the same mittens after two Wisconsin winters' worth of wear by a boy, now in second grade, who wears these mittens (and no others) through every snowball fight and sledding adventure, every day at recess, after school and every other time he goes outside--and here, we've still got a foot on the ground (although thankfully, it is melting fast). These mittens are getting too small for him now, the bright colors have yellowed and faded, but he's still wearing them. 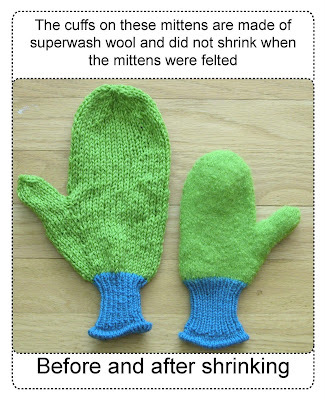 Bottom line: for ribbing on felted garments, put away that waste cotton & bring on the superwash wool. PS: Make sure to use a non-fuzzy yarn for the shrinky-parts, or the fuzz will get into the non-shrinking cuffs and make a mess. For further information about this, go to LIVNLETLRN, an illustrated entry on her blog.